Last weekend Robin and I and my baker boy cap did the city…but this weekend?? It was “country time” all the way!! Not really surprising, considering how big the gingham trend is right now. So imagine my glee when I popped into H&M last week to check out their summer sale and saw the skirt again…and with a $10 clearance tag to boot!! I took two sizes into the change room with me and ended up going with the larger one; not because my regular size didn’t fit, but because I’m (still) not a fan of high-waisted anything. The lesson here – of course! always! 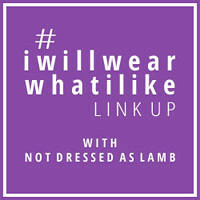 – is that #iwillwearwhatilike. Black and white gingham is a no-brainer for this neutrals-loving girl…but that doesn’t mean I have to wear the skirt up under my armpits (teehee) the way everyone else does. And what about you, dear readers?? I’d love to hear about the personal spin you’re giving your own summer trend faves!! I am so glad you scored that skirt! I am loving this gingham skirt trend. I have a really old gingham dress that I keep thinking I need to reconstruct into a crazy skirt. Life hasn't cooperated to give me time! Work is nuts and I have had other family priorities going. But I still may get to it sooner or later. In the meantime I can get vicarious pleasure from seeing yours! I always enjoy seeing your outfits! You always give trends a turn to your own style. Perfect! That skirt is adorable. I need more gingham in my life. What a great deal too. There have been times when I have coveted an item in a store, decided it was too expensive, changed my mind another day and found it gone, and then been willing to pay full price when it returned. Always better if you can get it for less.